Order your Conklin Mark Twain Crescent Filler Fountain Pen today from FahrneysPens.com. Fine Pens, Refills & Luxurious Gifts – great prices & fast shipping. Established in 1898 in Toledo, Ohio, the Conklin Pen Company quickly changed writing instruments forever when it patented the self-filling pen known as the Crescent Filler, now recognized as the world’s first practical self-filling fountain pen. With Mark Twain as its spokesman, Conklin thrived and Crescent Fillers became one of the most beloved pens in history. 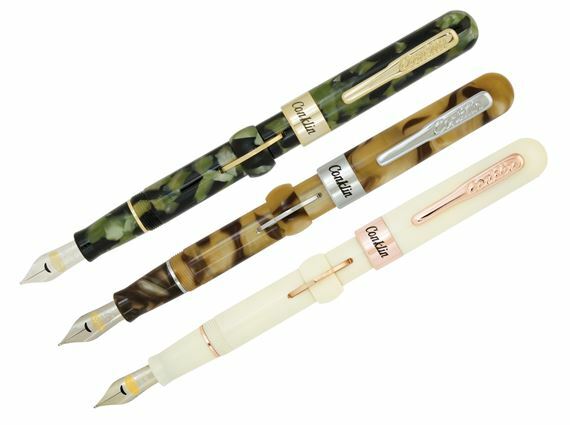 Three resin finishes for these newest editions were carefully selected to honor Conklin’s rich history and evoke models of its past: Golden Peanut Butter with chrome trim, Pure Ivory with rose gold accents, and Vintage Green with yellow gold fittings. The Crescent is known for its easy-to-fill reservoir. To load the pen, simply press the crescent mechanism on the barrel to empty the rubber bladder; ink flows back in as the crescent is released. The Crescent is fitted with Conklin’s Cushion Point flexible two-tone steel nib with crescent-shaped breathing hole in your choice of fine, medium or the popular STUB point – its great for distinctive signatures. The Crescent also features Conklin’s original spring-loaded Rocker clip design patented in 1916. Bottle fill only. Stub nib is all steel.